ഡോ.കാനം ശങ്കരപ്പിള്ള ,MS.DGO: The Doctor behind "Thampuran Mukku"
Ravivarmma wa born in 1884 as the son of Sri Neelakanda Sarmma an eminent Sanskrit scholar and ivory sculptor. He studied sanskrit and Ayurveda in traditional way in childhood and passed MBCM in 1911, studiying in Madras Medical College. He worked in Kottayam District hospital for sometime. He got DOMS in 1921 studiying in Mooefield Hospital, London. He was posted in Ophthalmic hospital,Trivandrum. in 1922. He continued there till retirement in 1940. He had 2 sons and 3 daughters in the first marriage and 4 sons and 2 daughters in the second marriage .His son Anirudha Varmma is a famous Neuro Surgeon. After retirement, he contributed liberally in Malayalam literature, linguistics, comparitive study of scripts in various languages and also in commentearies of Veda and Upanishads. During 1940-42 he worked as the Curator of Manuscript Library,Trivandrum. The first book of Pediatrics in Malayalam -Kumarabruthyam- was written by him .He had translated portions of Bhagavat Geetha for Einstein. After the term as Curator, he was appointed as Director of Ayurveda. Following an agitation by students he resigned in 1948. He died in 1958. He had good knowledge of Astrolgy .One of his sons,late Prathapa Varmma of Aranmula too was a good Astrologist. The accompanying photograph of Dr.Varma was given by this son. He was good in ivory carving and preparing gold ornaments. 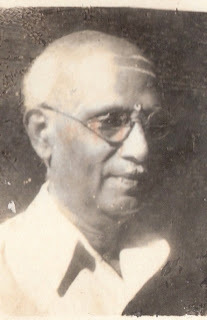 Dr.RaviVarmma was known as "Kannu Vaidyan Thampuran" and the place where he lived is still known as "Thampuran mukku".